Essential oils have enjoyed a thriving reputation in recent decades, thanks to a number of reported benefits, many of which have come to be backed by the medical community. Consisting of concentrated plant, floral, and fruit extracts, essential oils are prized for their potency and pleasant scent, thanks to the purity or “essence” of their distillation. Hanns Hatt, Ph.D., a professor in the department of cell physiology at Ruhr University Bochum in Germany and pioneering supporter of essential oil research, notes that "more than 50 odorants from essential oils have recently been identified and shown to do things like improve sleep, reduce anxiety, lower blood pressure, and even accel­erate skin regeneration." There are many reasons to add essential oils to your wellness regimen, from pain to anxiety relief, and sinus congestion is no exception. If left untreated for a substantial period of time, sinus discomfort can escalate into a serious infection, otherwise known as sinusitis. Sinusitis refers to the inflammation of the mucous membranes located in the nasal passages, with symptoms including headache, mild to severe congestion, and in more severe cases, fever. In some case, people with a severe sinus infection additionally report painful pressure in the ears and teeth, as well as facial tenderness. The good news is there is an wide variety of effective essential oils you can use to achieve instant sinus relief, through fairly simple application methods such as steam therapy (adding the oil to hot water and then inhaling) and external application. Whether your sinus infection is chronic or acute, the good news is there are a variety of essential oils you can use for relief. With what we believe to be superior sourced and harvested ingredients, we think you will agree that our oils are by far the most effective on the market - a wonderful smell that can't be beat! Among the most popular and arguably well-known of essential oils, lavender has been used since ancient times for both beauty and healing purposes. The Romans were famous for their use of lavender, employing it in their bathhouses, kitchens, and temples, while the Egyptians added it to their cosmetics, sacred balms, and medicines. Widely regarded for its anti-septic, anti-viral, and anti-fungal properties, lavender components gently help break down mucus build-up, as well as calm the senses and induce a restful night’s sleep. Application: Because of how mild it is, lavender essential oil generally doesn’t need to be diluted with a carrier oil when applied to the skin. You can also add it directly to your bathwater or diffuser, or simply inhale directly from the bottle. Additionally, you can sprinkle a few drops of lavender oil on your pillow before going to bed. Native to Australia, the eucalyptus plant has long been used by the Aboriginal people, with the first European distillation of the leaves performed by doctors in 1788 as an alternative cure for bronchitis and chest congestion. Since then, eucalyptus (or “Sydney Peppermint” as it was first introduced to Europeans) has proven itself to be indispensable in one’s essential oil arsenal. With its antimicrobial, antispasmodic, and antibacterial properties, eucalyptus not only helps to clear the air passages, but reduce mucus and phlegm build-up, as well as prevent overproduction. Application: UpNature recommends mixing eucalyptus oil with a neutral carrier such as olive or jojoba oil, then applied directly to the chest as a vapor rub. When it comes to reducing sinus pressure and congestion, peppermint essential oil is all but unrivaled. If severe migraines and muscle aches tend to accompany your sinus infections, peppermint oil’s high astringency not only provides fast relief but aids against future inflammation. Peppermint oil also acts as a mild sedative, helping to release tension and ease overall pain throughout the body. Application: Peppermint essential oil can be potentially toxic when administered on its own, so make sure to dilute it with a scentless carrier oil before applying to your skin or bath, and never ingest without following proper instructions first. You can, however, directly incorporate peppermint essential oil into your steam therapy routine (as the oil is only being inhaled). The instantly uplifting scent of lemon is hard to resist, and the cold-pressed extraction of the fruit’s rind can provide an equally beneficial boost to your nasal health. Lemon essential oil not only supports the body’s lymphatic and respiratory system, but assists in breaking down and releasing excessive mucus accumulation, which can block nasal passages and hinder breathing. Thanks to its high Vitamin C content, lemon essential oil properties can also boost the overall immune system while fighting off infectious bacteria. Application: Lemon oil is safe for consumption, and when added to hot tea can provide soothing throat and nasal relief. You can also add a few drops to your bath water or diffuser. Much like the eucalyptus plant, the tea tree (thus named by early English settlers who brewed the leaves in their teas) has long been a staple in the Aboriginal lifestyle. While tea tree essence is frequently featured in a variety of anti-blemish skincare products, the medicinal benefits are even more impressive. Thanks to its antiseptic and antimicrobial qualities, tee tree oil works to eliminate the germs that result in head colds and flu, as well as nasal infections. 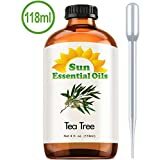 Application: Tea tree is best applied topically to the chest and throat regions, as well as behind the ears and under the nostrils, but make sure to dilute it in a scentless carrier oil first. You can repeat as many times as necessary for sustained relief. First documented by the ancient Greeks, Romans, and Egyptians for embalming and air purifying uses, thyme has yet to fall out of modern medicinal favor. Possessing an impressive array of antibacterial, antiseptic, anti-spasmodic, and expectorant components, thyme essential oil not only reduces sinus pressure and soothes inflammation, but boosts the overall respiratory and nervous systems thanks to its hefty antioxidant value. Application: Due to its potency, thyme essential oil should be diluted with a carrier oil when being applied to the skin. Inhalation and steam therapy are recommended. You can also mix thyme with other essential oils such as peppermint and rosemary, for an effective anti-congestion blend. More than just a mouthwatering addition to savory dishes, oregano has also enjoyed a hearty historic place among time-honored household remedies. With its high levels of carvacrol and thymol, two scientifically supported compounds touted for their anti-inflammatory and anti-fungal benefits, thyme continues to be used as a means for fighting off bacterial infections, as well as aiding in allergy and sinus infection relief. Application: Oregano is extremely powerful, and should always be diluted before external application. However, you can add a few drops of oregano essential oil directly to your food or take in supplement form. As with oregano, rosemary may strike you at first as more of an edible garnish rather than a beneficial wellness ingredient. On the contrary, with its robust antibacterial and anti-fungal properties, rosemary essential oil is a formidable aid in lymphatic cleansing, which in turn helps to strengthen the body’s entire immune system. Application: Steam is the best method for reaping the rewards of rosemary, with diffusion coming in at a close second. Add a few drops to your bathwater or steaming procedure, and repeat 2-4 times a day for daily relief. Once off-limits to all but royalty and the wealthy classes, thankfully cinnamon can now be inexpensively enjoyed by all. While commonly used in sweet dishes and warm frothy beverages, cinnamon also packs a powerful antioxidant punch, and is hard to beat as an anti-inflammatory aid. Because sinus infections are often caused by the inflammation and subsequent swelling of mucus membranes, with air flow severely hindered through the nasal passages, breathing cinnamon essential oil will not only help to calm inflammation, but allow you to breathe with ease. Application: Cinnamon is best enjoyed through a diffuser or humidifier, and should never be ingested, as cinnamon essential oil, unlike the spice itself, is extremely toxic. One of the first precious spices to be traded around the world, cloves have lost little of their popularity in the ensuing years, and are a particular favorite around the holidays. Packed with antibacterial, antiseptic, and anti-inflammatory properties, clove essential oil can immediately bring relief to more severe sinus congestive problems. Application: Surprisingly, the best way to apply clove essential oil is to inhale directly from the bottle. Carry clove oil in your bag for convenient on-the-go congestion relief. It’s worth stressing the importance of consulting with your doctor or a medical professional before adding any of the above essential oils to your daily healthcare routine, and never ingest any oils without explicit recommendation and proper guidance. With the proper research and selection of essential oils, sinus infection relief may be only moments away.